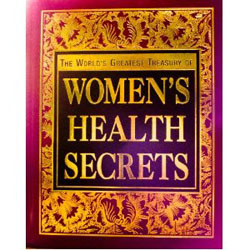 Treasury of Women's Health Secrets is a book written by doctors that targets women revealing health tips. The show is hosted by Gretchen Phillips, M.D and Arthur Johnson. This book was brought to you by Bottom Line the same publisher who brought us World's Greatest Treasury Health Secrets AND Ultimate Healing 2009. With your help we can reach more people and let them know about Treasury of Womens Health Secrets whether this product works or not.